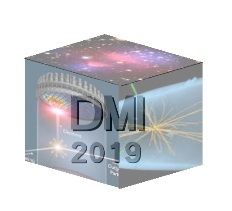 Dark Matter & Modified Gravity are being discussed at the Dark Matter & Modified Gravity Conference from 6 to 8 February 2019 at RWTH Aachen University, Germany. Interdisciplinary perspectives on astrophysical and cosmological observations as well as problems in the Standard Model of particle physics may imply the existence of Dark Matter and/or a modification of our theory of space and time. The numerous Dark Matter and Modified Gravity approaches, even in the light of the vast amount of relevant collider based and astrophysical observations is complex, but the overlap of the research may allow for a simplification. One focus of this conference is Dark Matter searches at the Large Hadron Collider (LHC)and the connection between theories of gravity. Discussions are planned on choosing between the two research programs, and choosing between different models in each research program. In this regard, a return of cosmology to Newtonian mechanics is herein proposed. Since the 1930's, astrophysical observations have implied the existence of Dark Matter because high velocities were measured. In the 1970's, the M31 spiral galaxy was extensively studied and shown to produce a flat rotation curve that also supported the notion that Dark Matter exists. 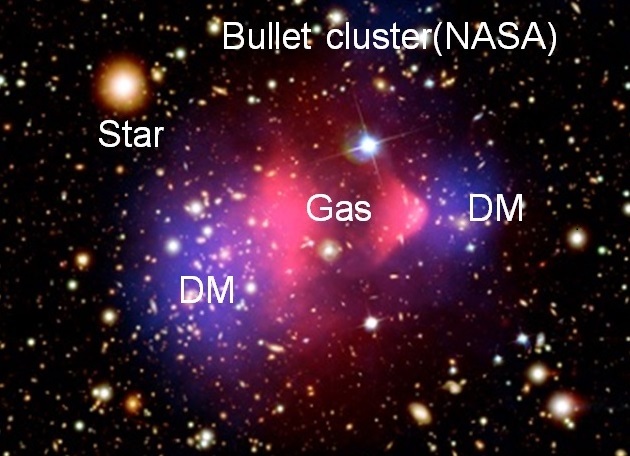 Only a decade ago, GL showed the Bullet Cluster could not stay together without the existence of Dark Matter. GL stands for gravitational lensing. In the above figure, the red area represents X-ray heating and the blue shows the Dark Matter derived from GL. However, direct experimental proof of a Dark Matter particle has not yet been found. In the alternative to the existence of Dark Matter, Modified Gravity has been proposed, but the agreement between numerical simulations of MOND and astrophysical observations is still only numerical, and lacking physical basis cannot be verified by experiment. But what if the notion that the existence of Dark Matter inferred from M31 and recent GL data including the Bullet Cluster is not correct? 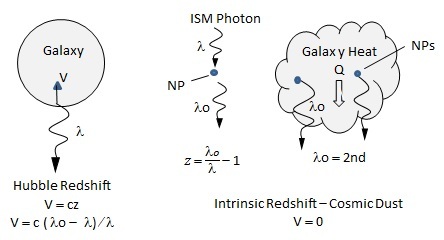 It is important to note, the astrophysical observations of Dark Matter were made with velocities inferred using optical redshift in Doppler's effect, and perhaps the redshifts overstated the velocities. In this regard, cosmic dust that permeates the Universe is proposed to redshift the light beyond that emitted from a distant galaxy. If the redshift from dust overstates the velocity of the galaxy to the extent that the galaxy cannot stay together as observed, it would be incorrect to assume Dark Matter exists, and instead, the velocities should be corrected for redshift in cosmic dust. Alternatively, by neglecting the dust redshift, the galaxy velocities would be lower bound by Newtonian mechanics. Unlike MOND, the redshift in cosmic dust may be experimentally verified and is a well -known phenomenon in laser experiments of NPs in nanotechnology. NPs stand for nanoparticles. Since Hubble, redshift of galaxy light in cosmic dust went unnoticed for almost a century because light interaction with NPs was assumed to follow classical physics and increase in temperature upon absorbing a galaxy photon. 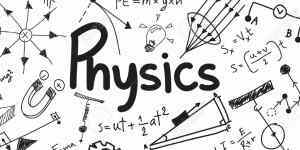 However, classical physics is not applicable as the dust is not macroscopic, but rather nanoscopic following the Planck law of QM that requires the heat capacity of the atoms in NPs to vanish, provided the NP atoms are placed under high EM confinement. QM stands for quantum mechanics. As nature would have it, EM confinement is naturally high in NPs because of their high surface-to-volume ratios, and therefore the galaxy photon is almost totally absorbed in the NP surface. Unable to increase in temperature, the NP cannot expand to relieve the surface heat, thereby providing the EM confinement necessary for the heat capacity of the atoms to vanish. Lacking a thermal response, photon absorption by a NP can only be conserved by a non-thermal mechanism proposed here as simple QED. Simple QED relies on the high surface-to-volume ratios of cosmic dust NPs to create, non-thermal standing EM radiation inside the NP across the diameter d having half-wavelength λo/2 = d. In effect, a galaxy photon having wavelength λ is redshifted to λo depending on the NP dimensions, i.e., the energy of the galaxy photon adjusts within the EM confinement defined by the NP dimensions between opposing dust surfaces. The speed of light c corrected for the refractive index n of the dust gives the Planck energy E of the redshifted galaxy light, E = h(c/n)/λo. On Earth, the galaxy light is observed to have wavelength λo with redshift z = (λo - λ)/λ, where λo = 2nd. Once the Planck energy of the galaxy photon absorbed in the dust surface is expended in forming the redshifted galaxy photon, the EM confinement vanishes allowing the redshifted photon to freely travel to the Earth. By correcting for overstated velocities, galaxy dynamics follows Newtonian mechanics, or the low velocity limit of Einstein's general relativity. Either way, cosmology returns to Newtonian mechanics once proposed by Einstein. For more details, see the tentative Conference Abstract and PPT Presentation. An Audio MP3 file is available. Open PPT and audio files in separate windows. Play the Audio MP3 file and manually follow with the PPT file. The EuroSciCon is the 11th Edition of International Conference on Structural Biology held during March 07-08, 2019 in Berlin. Structural Biology is directed to predicting the 3D structures of proteins using the computational techniques. Of interest is the computational methods in the folding and unfoldiibg of small proteins. Despite explaining protein folding using classical statistical mechanics and thermodynamics, few molecular dynamics (MD) simulations explicitly include basic physical electrostatics and Van Der Waals forces. Although folding occurs in isolation, MD simulations are performed with periodic boundaries. Heat provides the denaturant, and is simulated by specifying the protein temperature. Classical thermodynamics assumes the native folded state of globular proteins to correspond lowest-energy states, but this is not always true. Moreover, folding is a rapid process that occurs on microsecond time scales, but the response of proteins having a hydrophobic interior is a slow process. In contrast, electrostatic effects propagating at light speed and are important for rapid kinetics, but neglected in MD simulations. Dark matter research is undergoing a paradigm shift. Over the last few years, many novel theories have been proposed that challenge the standard assumptions made about dark matter. At the same time, new observations and simulation results are providing valuable clues regarding the most fruitful directions moving forward. The Novel Ideas for Dark Matter 2019 Workshop at Princeton University attempts to bridge the gap between communities working on non-standard solutions to the dark matter problem. Plenary talks on theory, observations and simulations will be structured into a three day schedule that will provide a broad overview of research avenues of this type. The workshop aims to promote conversations between research communities with ample time for open discussion. "it is difficult to believe that the velocities are real; that all matter is actually scattering away from our region of space. It is easier to suppose that the light waves are lengthened and the lines of the spectra are shifted to the red, as though the objects were receding, by some property of space or by forces acting on the light during its journey to the Earth"
Cosmic dust is a property of space and can redshift light by Hubble redshift or intrinsic redshift shown below. Hubble redshift is light emitted from a galaxy that is recessing from the Earth. By the Doppler effect, the recession velocity V is given by redshift z and the speed of light c. Intrinsic redshift may occur as a dust NP in free space absorbs a photon from the ISM or heat Q from the galaxy. Intrinsic redshift differs from Hubble as the NPs need not have any velocity. Over the past 50 years, observations are numerous and compelling that the linear Hubble law: V=HoD describing the standard redshift-distance relationship is not correct. Here, V stands for galaxy velocity and D for the distance to the galaxy from the Earth. Notably, observations show the presence of quasars physically connected to galaxies suggesting both are moving together having the same redshift, but the quasars are found to have far higher redshifts than the galaxies. "The Hubble constant and Intrinsic redshift in Cosmic Dust"
In conclusion, the Hubble constant is not a constant, but varies throughout the Universe. Moreover, the Hubble law is not valid because of the intrinsic redshift of cosmic dust. It is noteworthy that quasars do not follow the Hubble law. In fact, Hubble based his law on galaxies, but if he had first studied quasars, he would not have concluded the Universe was expanding. An expanding Universe based on the Hubble law is therefore unlikely suggesting the Universe is static and infinite as Einstein once thought. Neuro-degenerative diseases including Autism are characterized by the proliferation of cells from mutations of the neuron's DNA sequence. The DNA damage may be caused by exposure to exogenous agents such as solar UV radiation applied to the skin. However, Science does not recognize DNA damage from UV radiation in internal body tissue. But the implications of UV radiaton from large quantities of aluminum NPs found in the human brain changes this paradigm. NPs stand for nanoparticles. Indeed, neuron stimulation by UV radiation from NPs is serious problem. The UV is created because quantum mechanics precludes the conservation of heat from metabolic prodcesses to be conserved by an increase in temperature. Instead, UV radiation is emitted that is in fact risky as the DNA damage, if not repaired by the immune system lead to autism. See PR. 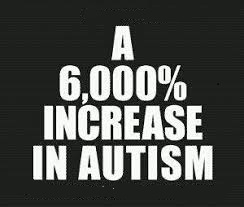 "When I was growing up, Autism wasn't really a factor and now all of a sudden, it's an epidemic. Everybody has their theory, and my theory is the shots. They're getting these massive injections at one time. I think it's the vaccinations." Of interest here, is the link between vaccination adjuvants and autism. Aluminum adjuvants are essential in vaccines to stimulate immune activation of antigens. Without adjuvants, antigen stimulation would be ineffective making vaccinations meaningless. Typically, adjuvants are 10-100 nm submicron NPs of aluminum hydroxide Al(OH)3 that agglomerate into larger particles with sizes of about 2-20 microns.By the theory of simple QED, the UV producing adjuvants are the 10-100 nm submicron NPs and the larger 2-20 micron particles that are benign in producing UV. Simple QED conserves metabolic heat by creating non-thermal EM radiation standing across the NP diameter d having half-wavelength λ/2 = d as the heat adjusts to the EM confinement bounded by the NP surface. The speed of light c corrected for the refractive index n of the NP gives the Planck energy E = h(c/n)/λ, i.e., E = hc/2nd. Hence, the 2-20 micron particles produce EM radiation in the IR that is harmless in damaging DNA; whereas, the 10-100 nm submicron particles do indeed produce EM radiation in the UV and beyond. The Dark Matter Identification (DMI) workshop is to be held on 1-12 April at Johannes Gutenberg University in Mainz. The workshop Program is to bring together experts from various Dark Matter (DM) communities: model builders, astroparticle physicists, collider phenomenologists, experimentalists and developers of DM tools and to catalyse discussions and collaborations in the atmosphere of the real workshop. Reasons for Participation: I have developed a cosmology based on the Planck law of quantum mechanics that argues cosmic dust increases the redshift above that given by Hubble thereby overstating the galaxy velocities to the point that dark matter is thought to exist to hold the galaxy together. So, the LCDM model is not necessary as galaxy dynamics follows Newtonian mechanics. Starlite is a material claimed to be able to withstand extreme heat without high temperature. It was invented by British amateur chemist Maurice Ward during the 1970's and 1980's, and received significant publicity after coverage of the material aired by the BBC in 1990. In 2018, the BBC re-showed their 1980 Starlite presentation. Since 1980, NASA and other major technological companies have reviewed Starlite, but to this day Starlite is not yet commercialized. Ward, who died in 2011, never revealed the composition of Starlite, which is still unknown, but is said to contain a variety of organic polymers with both organic and inorganic additives. Simply put, Starlite is a mixture of corn starch, baking soda and PVA glue. PVA stands for poly vinyl acetate. Starlite is claimed to be able to withstand heat from a laser beam that otherwise would produce a temperature of 10,000 C.
To explain Starlite, heat transfer of NPs in a matrix of PVA glue is required. NPs stands for nanoparticles (< 100 nm) of corn starch and baking soda. But in 1980, heat transfer was dominated by classical physics where heat absorbed by NPs does indeed increase in temperature with the Stefan-Boltzmann radiation equation describing temperature. But heat transfer of NPs requires simple QED based on QM as the NPs are nanoscale. QM stands for quantum mechanics while simple QED is described throughout this website. 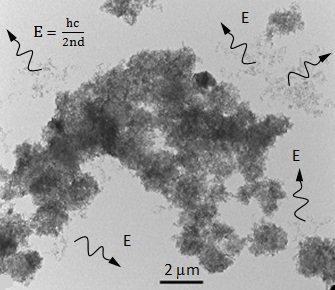 Briefly, simple QED requires the heat capacity of isolated NPs vanishes in a thermally expanded matrix of a low density solidified glue, and therefore the NPs conserve heat of the blow torch by the emission of EM radiation. As shown in the BBC presentation, VIS light in the red was emitted. But not seen is emitted UV light. Except for a small temperature increase in the PVA glue, there is no increase in the temperature of the NPs as almost all of the heat is removed by EM radiation, thereby explaining how the egg remains raw after exposure to blow torch heating. 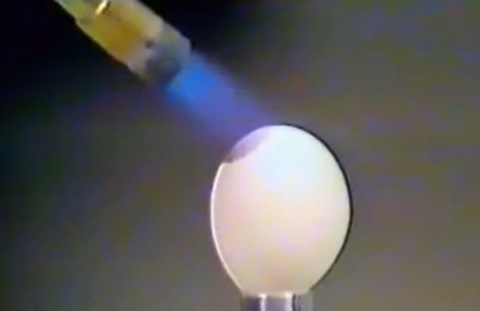 For verification of Starlite by simple QED, NASA is recommended to perform spectroscopic measurements of the EM emission from the blow-torch heated egg. 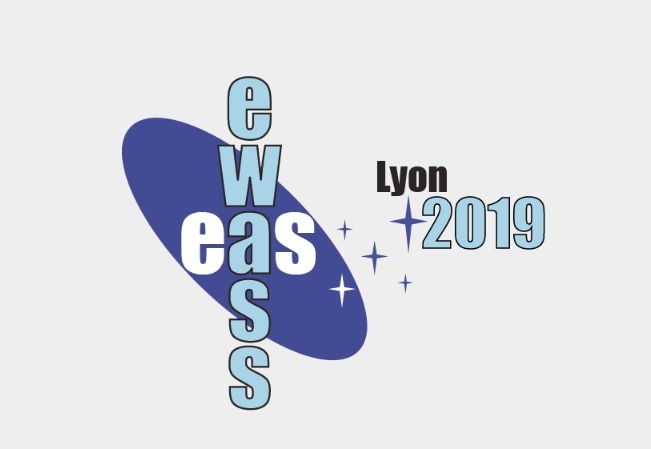 EWASS 2019 is to be held in Lyon, France from 24 to 28 June 2019. Of interest are 2 areas of astronomy as related to the physics of simple QED. In cosmology, galaxy velocities are inferred from redshift measurements of light emitted from the galaxy. In a dust free Universe, redshift of galaxy light would indeed provide accurate velocities. However, dust absorbs galaxy light on its way to the Earth, especially in the galaxy itself, causes an additional redshift thereby overstating galaxy velocities. light. causes an error velocity measurement. Indeed, the redshift in cosmic dust is significant as inferred velocities suggests Newtonian physics can no longer explain how cluster galaxies stay together. In the 1970s, redshift measurements of the M31 galaxy inferred the galaxy clusters could only stay together as observed if dark matter was present. Since then, astronomy has conducted experiments to find dark matter, but to date has not been successful. Apparently, the Astronomy community does not like my allegation that Dark Matter only exists because of the measured redshift is caused by cosmic dust that effectively means Newtons mechanics governs celestial dynamics. Since Hubble, taxpayer funding of Dark Matter searches has been a fraud committed by Astronomers to satisfy their egos. Indeed, Hubble never thought the redshifts he measured were real, but Astronomers of lesser intelligence created an expanding Universe out of their own making. What we have in front of us is an Astronomical future based on false science. Sad, but true. The Missing Neutrino Problem was thought resolved by revising the standard model of the massless neutrino to consist of 3 types: electron, muon and tau. Experiments at the Sudbury Neutrino Observatory that measured all neutrino types did not show a deficit thereby confirming the standard neutrino model modified only for oscillating non-zero rest masses between neutrino types. However, Shrair in 2017 and others argued neutrinos need not oscillate to account for the deficit. Similarly, this paper suggests there is no Missing Neutrino Problem, i.e., the standard neutrino model is correct, but the standard solar model needs revision. The paper argues solar collapse produces temperatures of 6.8 million K, but to undergo fusion hydrogen atoms must increase in temperatures to 15 million K. However, simple QED claims the temperature cannot increase as QM requires the atom heat capacity to vanish. But the equivalent of temperature is EM energy E, i.e., at 6.8 million K, E = 1.5 kT = 0.87 keV. Like a 0.87 keV CW laser irradiating hydrogen atoms, the EM energy increases with 3 plasma 0.87 keV photons reaching the 2 keV required for fusion at which time a neutrino is emitted. However, EM energy absorption continues, but the hydrogen atom is absent a higher electronic quantum state, e.g., hydrogen cannot emit X rays. Only the size dependent simple QED state at 5.8 keV is available. Hence, the same atom that initiates fusion at 2 keV also provides the missing source of energy in the solar model, and therefore the number of neutrinos is 2 / 5.8 = 0.34 of that expected for the solar heat produced. In conclusion, there are no missing neutrinos. The standard neutrino model is correct, but the solar model needs to be revised for simple QED. See abstract. One fusion reaction produces one neutrino. To initiate fusion, the standard solar model was a sun with a central temperature T = 15 million degrees K corresponding to EM energy E of about 2 keV, where E = 1.5 kT and k is Boltzmann's constant. Since then, hydrogen fusion is generally thought to require E > 2 keV, but is not available in gravitational collapse. In 1964, Davis showed by experiment the neutrinos produced were found to be fewer, about 1/ 3 the number predicted. The standard model of neutrinos is a massless particle moving at the speed of light. Over the next decades, however, repeated experiments and predictions showed a similar deficit of neutrinos. This dilemma referred to as the Missing Neutrinos Problem was resolved by revising the standard model of the massless neutrino to consist of 3 types: electron , muon and tau, each having different, but small masses. Moreover, the neutrino was allowed to oscillate from the electron type in the sun to muon or tau types on its way to the Earth. Since the sun only produces electron neutrinos, and since early experiments detected only electron neutrinos, the Missing Neutrino Problem was thought resolved by claiming the missing 2/3 of muon and tau neutrinos were just not detected. More recently, SNO experiments that measured all neutrino types: electron, muon, and tau did not show a deficit thereby confirming the standard neutrino model modified for oscillations among neutrino types. SNO stands for Sudbury Neutrino Observatory. In 2017, Shrair and others argued neutrinos need not oscillate on their way to Earth to account for the deficit. In fact, the number of solar neutrinos detected from the above experiments is the actual rate of solar electron neutrinos. What this means is there is no Missing Neutrino Problem and the standard massless neutrino model is correct while the standard solar model needs revision. In conclusion, the Missing Neutrino Problem need not be resolved by oscillations among non-zero rest masses for the electron, muon, and tau, at least until the underlying physical mechanisms are understood. In contrast, simple QED is based on the established Planck law of QM which requires the heat capacity of the hydrogen atom to vanish meaning the 15 million K temperature of the sun is meaningless as a basis for understanding of solar fusion, and instead fusion in the sun should be considered initiated by EM energy at 2 keV. Nothing could be simpler. The central sun region is likened to a 0.87 keV CW laser irradiating hydrogen atoms with a size dependent quantum state at 5.8 keV. There is no Missing Neutrino Problem. The number of neutrinos emitted is the number of 2 keV EM fusion events and the 5.8 keV state is the upper limit of EM solar energy emitted, the number of neutrinos emitted is 2/5.8 = 0.34 or about 1/3 of that expected if neutrinos were emitted for the total solar heat. The standard model of the massless electron neutrino in the sun is correct, but the standard model of solar fusion needs revision for simple QED. The difficulty that atoms cannot get close to each other to initiate fusion thought resolved by QM allowing fusion to occur over a short time is superseded by simple QED allowing 5.8 keV photons to initiate fusion at other hydrogen atoms over a finite distance. Molecular motors - myosin, dynein, and kinesin - have been studied with regard to the mechanism by which the motors are powered. In muscles, the myosin molecule provides the power of contraction, while in dynein and kinesin the power transports cargo within the cell along microtubule filaments. The following is limited to kinesin, but is applicable to both myosin and dynein. The kinesin molecule has twin heads and moves towards microtubule plus end using a hand-over-hand walking action that can do work [1,2]against loads of up to 7 pN. In the manner of Brownian motion, the motor is thought to diffuse back and forth on a spring-like tether using thermal energy from the bath to stretch out the tether, locking on to the track as the spring is stretched out, and then the motor advances while maintaining its grip on the microtubule as the spring relaxes. In the alternative, a change in the neck linker molecular conformation is thought to convert Brownian motion to advance the motor. The free energy of docking the neck linker to the microtubule is found  very small while MD simulations  show forces in unbinding are very large and consistent with clamp experiments. However, MD simulations of the conversion of thermal energy into motor motion do not show how ATP hydrolysis produces the energy for the power stroke that comes from thermal fluctuations. Instead, thermal energy is simply assumed to control the force developed from Brownian motion while thermal vibrations allow searching for a binding site, and during or after completion of the power stroke, thermal fluctuations dislodge the kinesin from the microtubule. But how this occurs is not found anywhere in the literature. Currently, the general belief is that Brownian motion induced by thermal fluctuations is important in the motion of kinesan motors. However, electrostatic forces from chemical additives to the bath can induce charge to steer  the neck linker and coiled tether to the microtubule are also important. Indeed, additives that make the neck linker and tether more positive were found to increase motor motion while negative charge decreased the motion. However, some kinesins  have neutral coiled tethers, yet still show increased motion suggesting that another region of the molecule may perform this tethering role. But explanations of how electrostatics affects motor motion is not well understood. In this paper, simple QED induced EM radiation  produced in nanoscale structures is proposed to explain molecular motors. Simple QED is a consequence of the Planck law of QM that requires the nanoscale neck linker and coiled tether to charge positively directly from ATP binding or even from heat in the water bath. QM stands for quantum mechanics. The QM charging of the neck linker and coiled tether occurs even if chemical additives are not included in the bath as would be the case for neutral coiled tethers. Indeed, charge is induced in all nanoscale structures because QM requires the heat capacity of atoms in the nanostructure to vanish thereby precluding any conservation of absorbed heat by an increase in temperature. Simple QED stands for quantum electrodynamics of real photons differing by simplicity from Feynman's complex virtual photons. Simple QED conserves heat from ATP hydrolysis or thermal heat of the bath by creating EM waves that by the minimum time principle of Fermat stand across the minimum dimension of the nanostructure, e.g., across the diameter of neck linker and coiled tether. Basic motor electrostatics is illustrated in the following Figure. 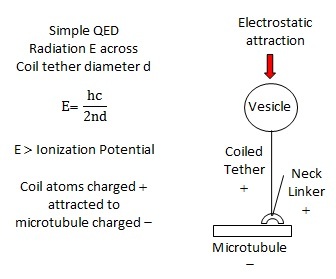 Since the simple QED radiation exceeds the respective ionization potentials, electron loss charges the coil and linker positive, and since the microtubule carries a negative charge, electrostatic attraction pulls the tether downward to the microtubule. Upon contact, the neck linker acquires the negative charge of the microtubule and is repelled then allowing the neck linker to acquire a positive charge for the next microtubule contact. An enlarged view of electrostatic molecular motor mechanism is illustrated in the Figure below. The neck linker comprising Head 1 and Head 2 is shown in gray moving in the forward direction along a microtubule of α+ and β- tubulin dimers. 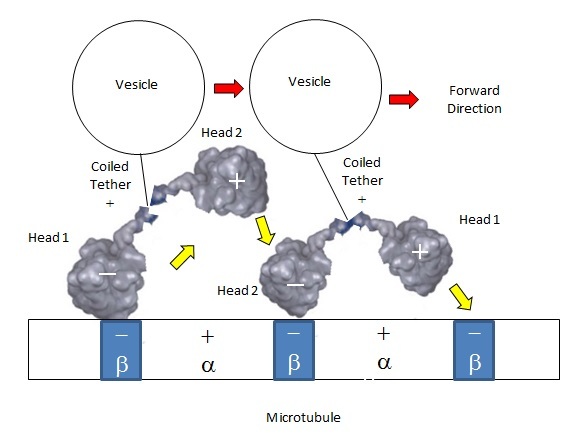 The coiled tether shown as a black line connects the neck linker to the vesicle carrying the cargo. Head 1 on the left is shown charged negative and bound to the first β- tubulin site, but because of subsequent mutual repulsion Head 1 is shown moving upward. Head 2 and the coiled tether are charged positive by simple QED with Head 2 attracted to bind a the second β- tubulin binding site. At this time, Head 1 in a hand-over-hand motion moves toward the third β- tubulin binding site. Since both α+ and β- tubulin dimers are about 8 nm in length, Head 1 moves over 2 of the α+ tubulin sites or 16 nm in the forward direction. 7. T. Prevenslik, Applications of simple QED in nanostructures. See www.nanoqed.org, 2010-2019. Matera Obscura is a conference directed to an understanding and unveiling the nature of dark matter - the long-lasting challenge of modern astrophysics. However, dark matter requires the existence of mass about 5 times that on Earth, and moreover is invisible and cannot be observed. Because of the bizarre nature of dark matter, it is only natural to question whether dark matter even exists. In this regard, a review of how dark matter was first thought to exist showed cosmic dust increases the redshift of galaxy light thereby highly overstating galaxy velocities to the point that a significant amount of mass was present to hold the galaxy together. Indeed, Newtonian mechanics showed clusters of galaxies should fly apart, but in fact was not observed. Since then, astronomers therefore believed dark matter existed to hold the galaxy clusters together. In conclusion, dark matter most likely does not exist. The astronomy community is recommended to conduct extensive Earth based experimental studies of redshift of laser light in various sizes of cosmic dust nanoparticles. In any evenr, a return of cosmology to Newtonian mechanics once proposed by Einstein is suggested. The 10th Anniversary World Congress on Targeting Mitochondria will be held in Berlin on October 28-29, 2019. The themes of the Congress will focus on three major areas, the first being mitochondrial chronic diseases including aging, the second how to quantify mitochondrial dysfunction, and the third, how to target and manipulate mitochondrial function in order to develop mitochondria-based therapies. In the generation of ATP during respiration, chemiosmosis is the flow of hydrogen ions across the inner membrane of mitochondria providing power for producing work at the cellular level. However, the chemistry explanations of chemiosmosis are complex and are difficult to verify experimentally. A totally different approach to ATP synthesis based on the physics of simple QED is suggested. 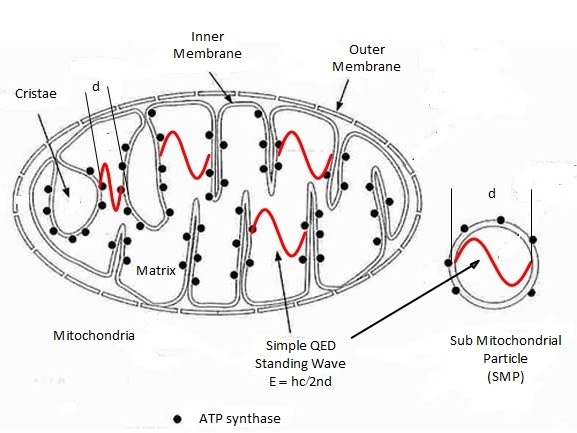 ATP synthesis in mitochondria is proposed to occur by simple QED that does not depend on electron induced pumping of hydrogen ions across the inner membrane. Simple QED differs from the QED proposed by Feynman in that real and not virtual photons stand across the matrix between adjacent cristae surfaces of folds in the inner membrane, the EM energy at UV levels breaking oxygen double bonds to power ATP production. The source of UV is ATP energy released in the matrix. The human lung mitochondria showing the EM wave standing in the matrix between the fold formed between adjacent cristae is noted in the following figure. In the matrix with a spacing d between adjacent cristae (50 < d < 100 nm), the Planck energy E of the standing EM waves based on a refractive index n ~ 1.3 is beyond the UV, i.e., E ~ 5 to 10 eV thereby providing at least 500 kJ of UV radiation for every mol of ATP released. Depending on the molar concentration of oxygen in the matrix, the oxygen superoxide anion is formed by breaking the double bond of oxygen. The oxygen anions break down carbohydrate foods, and convert ADP back to ATP. Of importance, ATP release requires a conitnual supply of oxygen for the mitochondria to produce ATP. Hydrolysis of ATP to ADP and phosphate is highly favorable in aqueous solution producing an energy release of 30.5 kJ / mol ATP. In contrast, the molecular mechanism of oxidative phosphorylation in metabolic breakdown reactions is converted into phosphate bond energy through a "high-energy intermediate", i.e., a chemical compound generated by an enzymatic oxidation-reduction reaction capable of transferring a phosphate group to ADP. But after decades of research, the "high-energy intermediate" was never found. Chemiosmosis does not require a "high-energy intermediate". Instead, respiration and phosphorylation is coupled by an electrochemical gradient of H+ ions across the mitochondrial membrane, i.e., the flow of electrons through the respiratory enzymes is linked to a net movement of H+ across the inner mitochondrial membrane that creates a transmembrane electrochemical potential comprising an osmotic pressure and an electric field component. The electrochemical potential powers the ATPase, an enzyme which is also located in the inner mitochondrial membrane that carries out the phosphorylation of ADP to ATP. ATP by chemiosmosis with oxidation by the electron transfer chain OR oxidation by the molecular mechanism by "high-energy intermediate" are both based on complex chemistry that is difficult to verify experimentally. In contrast, oxidation by mitochondrial induced UV radiation is simple and understood by all. But UV is only naturally available as exogenous solar radiation outside the body - not endogenous UV produced within the mitochondria of human cells. In this regard, simple QED is proposed to produce endogenous UV within the mitochondria itself. Instead of chemiosmosis, ATP is proposed produced by standing EM waves of endogenous UV as shown below. Simple QED differs from the QED proposed by Feynman in that real and not virtual photons stand across the matrix between adjacent cristae surfaces of folds in the inner membrane, the EM energy at UV levels breaking oxygen double bonds to power ATP production. Any submicron organelle produces endogenous UV provided metabolic heat is produced. 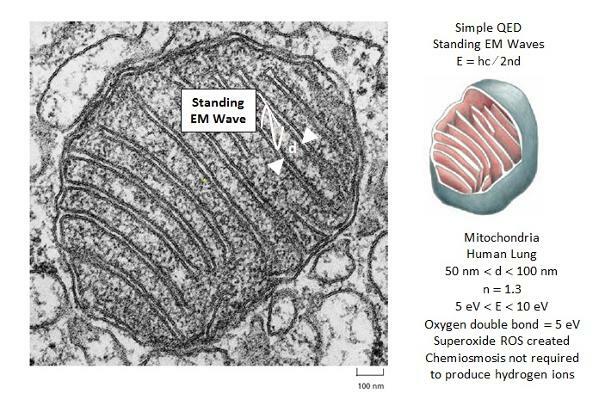 In the figure below, standing EM waves are shown produced in human lung mitochondria including standing EM waves within submicrondrial particles (SMP). A preliminary Paper on ATP produced by endogenous UV is available. Historically, ATP by chemiosmosis competed with the molecular mechanism of oxidative phosphorylation that relied on the conversion of metabolic heat to phosphate bond energy through a "high-energy intermediate". But after decades of research, the "high-energy intermediate" was never found. By default, chemiosmosis survived as the sole theory for ATP production. Chemiosmosis does not require a "high-energy intermediate". In mammals, simple QED produces ATP in mitochondria by endogenous UV inside the cell. In the 1960's, ATP researchers failed to recognize the fact a pH change is accompanied by a release in heat that increases bath temperature typical to that shown in the above plot of titration of a weak acid with NaOH. But locally, the grana cannot increase in temperature by the Planck law of quantum mechanics. Hence, the observed ATP production was not due to the H+ gradient across the inner membrane, but rather the excess heat causing the grana to locally conserve the heat by simple QED creating EM radiation beyond the UV that produces the ATP. Simple QED relies on real photons and differs from the virtual photons in Feynmans QED.